Mac users who have multiple email accounts setup with the Mail app may wish to change or set the default email address that is used throughout Mac OS X. This can help to prevent accidentally sending an email from the wrong email address, which should be particularly helpful for those who juggle work and personal email accounts within the Mail app. What this is going to do is set the default email account for any new email message composition in the Mail app. 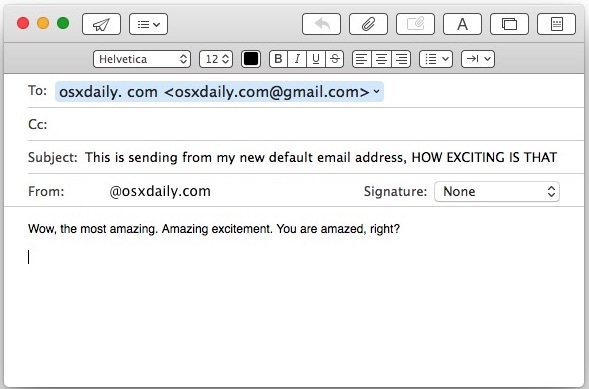 That includes new mail compositions created from within Mail.app and also elsewhere in Mac OS X, like a mailto link in a web browser or another app. To be clear, this does not disable the other email accounts or disallow their use in Mail app, it simply sets the preferred address to be the default for mail. Even after setting this you can continue to switch mail addresses easily in compositions. Now the next time you go to compose a new email message, either from Mail app or elsewhere, that email account selected will be the new default email address that any new mail is sent from. If the chosen email account uses an HTML signature, that will also be included by default with each new mail message. 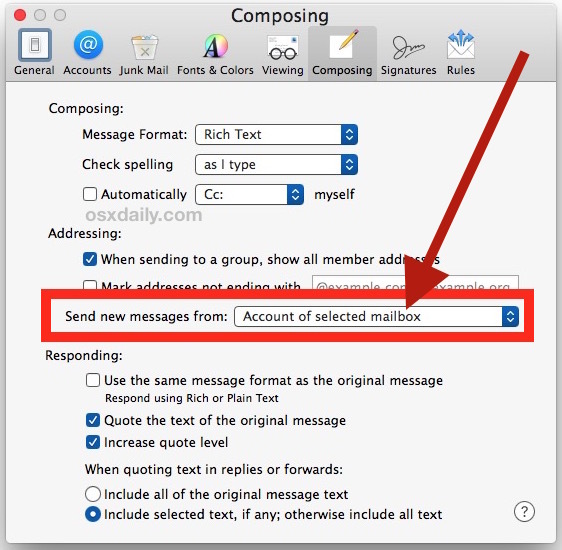 For those of us who use Mail for personal and professional email accounts, this setting pairs well with always showing the complete full name and email address of recipients in Mac Mail so that you can be sure you’re not only defaulting to writing from the proper email address, but also sending and corresponding to the proper addressee. By the way, if you’re adjusting this on the Mac you’ll almost certainly want to change the default email account on iPhone and iPad too, assuming you use the same email addresses on the go as well. This helps me out a lot! I have spent months trying to do this. Thanks Paul. You’re welcome! It’s not the most clearly labeled setting out there, but it sure is useful if you juggle multiple email accounts in Mail for Mac. Thanks for reminding me about this. I just set it to my list alias rather than my primary account, because I reply to mailing lists more often than I correspond personally. What I wish is that the Mountain Lion behaviour of defaulting the email address based on the recipient would come back. In this way, mailing lists always default to sourcing from your chosen address, while all other correspondence goes to the default. This was broken as of Mavericks, and I have a note here to report it to Apple, someday. Sometimes I find that if I reply to myself, to follow up on what I’ve already said, the From is already set, but I think that’s expected behaviour; Apple Mail is one of the few clients that sensibly sets the recipient fields when replying to yourself (it uses what you used before, instead of just replying to yourself). I wish this worked for me, but it doesn’t. My domain-name email address (myname@mydomain.us) points email to my gmail account. I have the “Send new messages from” set as you say, and the “From” line on the mail-composition window says “myname@mydomain.us” but recipients get my gmail address in the “From” line. Yes, I have the same issue. I cannot select myname@mydomain.com…points to my gmail account. I cannot select my domain account…just gmail and bell south.net. Please help. Been struggling for hours now. You can teach an old dog new tricks …….. sometimes!!!!! Hi. Question for you. I accidentally Deleted my main email acc in preferences. Every time I try to reinstall it , I get this acc already Exsist’s ! But it’s not in the list of accounts. Short of using Time machine to go back before I deleted it , any way of reinstalling it ? Thks in advance Walter. My problem is that although I have 4 email addresses set up in Mail, when I go to the drop down menu “Send messages from” only my apple email addresses (myname@me.com and myname@icloud.com) show up and not any of the others. I’ve the same issue but now, It got solved after this post.